It is the original green machine - the car that forever changed the motoring world. Yet two decades and more than 12 million global sales later, Toyota's Prius remains something of an oddity - beloved by some and derided by others. Now well into its fourth generation, the recently-facelifted Prius remains instantly recognisable - by its polarising looks as much as its near-silent mode of operation - but risks falling victim to the revolution it helped to start. It's a bit like watching Serena Williams, nearing the end of her stellar career, being overwhelmed by the type of power hitting she pioneered. The Prius, having created a low-emissions motoring world, is just another option among many these days - and probably not even the best one, at that. Maybe that should come as no surprise - the Prius recently celebrated its 21st birthday and fundamentally has not changed all that much from the car that set the automotive world on its ear around the turn of the millennium. Nobody should underestimate the role the Prius has played in pushing our car makers to become leaner, meaner and greener with every model they make. Even performance brands like Ferrari closely monitor their carbon footprint these days - while premium makers like Jaguar and BMW have dived head-first into the fully-electric world that seems certain to become our driving future. The world looked very different when the Prius first combined a small and buzzy four-cylinder petrol engine with an electric motor that helped share the load, vastly reducing fuel consumption and carbon emissions. At the time, the leading German makers sniffed at the hybrid idea and dismissed the Prius as a fad - instead pouring billions into further developing their preferred diesel and petrol engines. It's fair to say Toyota is having the last laugh these days. We recently tested an updated version of the fourth-generation Prius and couldn't help but notice how little the car had changed since those early days. I remember my first Prius test drive, when a work colleague summed up the general consensus when he declared that "someone has left a giant cockroach in your parking spot". That car was something of an ugly duckling - and has since evolved into a ... slightly less ugly duckling. Of course, those odd looks were a deliberate tactic - this was a truly unique, ground-breaking machine and it was designed to look that way. Today, with even the most conventional-looking cars - including SUVs - using hybrid-electric power, the need to stand apart from the crowd seems a bit pointless. Yet in its most recent iteration the Prius looks perhaps more awkward and polarising than ever. Nowadays the Prius is far less of a novelty - and is just as likely to be driven by your local taxi operator keen to save on his fuel bill, than by some Hollywood celebrity trying to save the planet. We tested the Prius in its most basic form, carrying a retail price tag of $36,590 pus onroad costs. For that money you can forget about such luxuries as alloy wheels or leather seats - even though the Prius has always been generously equipped. Standard kit includes a centrally-mounted, seven-inch touchscreen, rain-sensing wipers and automatic, self-levelling LED headlights, reversing camera, head-up display, climate control and a premium audio setup. If that sounds enticing, it's worth noting the price is almost $7000 more than the larger, much more attractive and almost as fuel-efficient Camry Hybrid - while the similarly-frugal Corolla Hybrid starts from just over $25-grand. 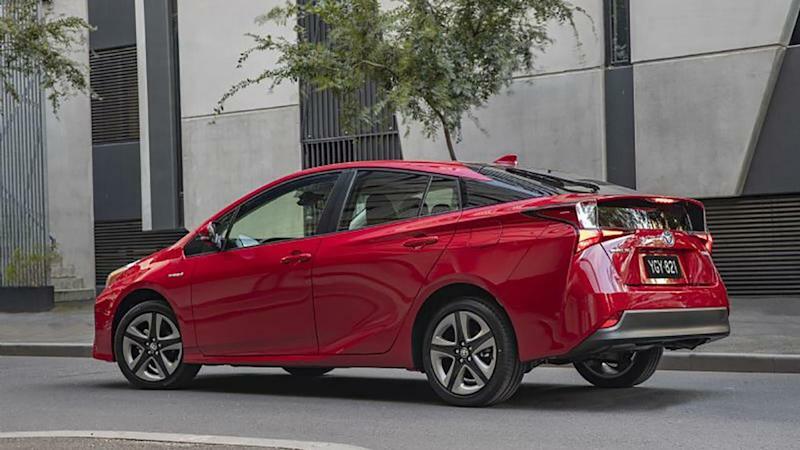 And while those cars have recently received some seriously upgraded styling from Toyota, the Prius shape is still a bit like a crushed shoebox.The closest it has come to changing its basic design was the addition of the Prius V (an elongated hatchback/wagon variant) and the Prius C (a smaller coupe-style model). Inside, the formula has remained largely unchanged for most of its two decades - from the centrally-mounted instrument panel to the ageing touch-screen and even the same weird little gearstick. The Prius experience is also faithful to the original - the same silence on start-up, giving way to the hummy, buzzy engine note when you call for more performance or the hills get steep. The Prius remains a fairly sedate, unexciting thing to drive - and certainly all-electric rivals like Nissan's Leaf and BMW's i3 would run rings around the little Toyota in terms of performance and driving engagement. Even the Prius' dazzling average consumption, while improved, has not shifted markedly since those early days. That just underlines what an incredibly clever piece of technology this has been right from the very outset. Our test returned 4,1L/100km over more than 200km of mostly inner city driving - keeping in mind the Prius is one of the few cars that actually uses less fuel in city than on the freeway. Ironic, I suppose that the car that helped change so much has changed so little. Does that spell the end of the Prius - the car that, in many ways, started us on the path to greener motoring? HOW BIG? It's a modestly-sized hatchback, but its boxy design helps deliver impressive interior space and a large cargo capacity. It's also light and nimble to drive. HOW FAST? In Sport mode it's surprisingly perky, but select Eco mode to maximise its legendary fuel-efficiency and you'll need patience. HOW THIRSTY? The Prius has always delivered freakishly frugal motoring - and this one is the best yet. We averaged a stunning 4.1L/100km. HOW MUCH: Prices for the basic Prius model, tested here, start from $36,590 plus on-road costs. The higher-spec i-Tech version is $44,050.